[Note: The Conductor of Train #412 was my great-great uncle, E. E. Hittle of Huron, South Dakota. He was married to Maude Graves, sister of my great-grandmother Elvirta Knutz. As far as I know, he walked away from the crash without injuries. Webster defines the term “Perfect Storm” as a critical or disastrous situation created by a powerful concurrence of factors. And that is precisely what culminated on the morning of Sunday, April 25, 1937, when Chicago and North Western passenger Train #412 plowed into the rear of Train #504 just west of De Smet, South Dakota, killing one and injuring several others. It was described as a “freakish late-April storm” that rolled into the area on Saturday, April 24, bringing strong north winds of 60-65 mph. Only an inch of snow was deposited in the city of Huron, but massive drifts high enough to cover the fence line could be found east of Huron between Iroquois and De Smet. Highway 14 was quickly impassable, with dozens of cars stalled and abandoned near Manchester, as their inhabitants made their way into town to catch the eastbound train to their destinations. Map of pertinent area in eastern South Dakota, courtesy of Google Maps. Late Saturday evening, Train #504 left the depot at Huron for its eastward run, hauling a passenger car plus five other cars, with a gas-electric motor coach that was hitching a ride, or “deadheading,” to Tracy, Minnesota, at the end. All was uneventful but for a few small drifts until they were within three miles of De Smet, when the train met its match in snow and became stalled. Conductor Arthur Howard, of Huron, and his Engineman Mr. Key, thought the train might have a better chance without the deadheading motor coach, so it was detached and they attempted to thrust the train through the deep snow, but this effort was unsuccessful. The crew then attempted to get the detached motor car back to Manchester to summon help, but the high winds and heavy snow only allowed about 50 feet of movement before it, too, was stuck. Engineman Key sent out the flagman to the rear of the train, and they made the decision to have Conductor Howard try to walk the three miles to De Smet for help and to notify the proper people of the stall. The Flagman Mr. McIntyre sprang into action to minimize a very dangerous situation. This area of track was single-rail; trains were operated on a timetable, with train “orders” and a manual block-signal system during the day. During other times, “time spacing rules” were in effect to prevent accidents. Flagman McIntyre situated a red fusee (very similar to a flare) about 500 feet behind the train, and continued walking until he found another clear spot on the rail on which to put torpedoes to alert any oncoming trains. Continuing, he put another two torpedoes down about 1/4 mile from the train, then went back to the train to warm up. He went out a second time, this time 3/4 mile from the train. Overnight, he made several trips back and forth, standing guard to get the attention of any approaching train, and returning to his train when his eyes and face were covered with the freezing heavy snow. In the early morning hours, he and baggage man Fred Behrens, of Tracy, decided to try to get to a nearby farm house in hopes of being able to contact the depots in Huron and De Smet to let them know of their predicament, and bring back some food for the passengers, despite their conductor already being on the way to summon help. In his absence, Flagman McIntyre enlisted Baggageman Venard to take his place as flagman. Although Venard’s 16-hour “tour of duty” would soon be expiring, McIntyre did not consider it of importance during an emergency situation, and departed with Behrens. They were ultimately not successful in locating the farmhouse, and leaving Behrends behind, McIntyre proceeded to De Smet. Meanwhile, Venard acted as flagman, but informed Conductor William Innes, who was in charge of the deadheaded motor car, that his 16 hours were nearly up, expiring at 7:40 a.m. According to Venard, Innes replied that he would take over the flagging duties at that time. When 7:40 rolled around, Venard came back to the train, and made a sign to Conductor Innes, who nodded back. Venard took this as a sign that Innes would take over, and he proceeded to the mail/baggage car and went to sleep. Sharing responsibility with Innes for the deadheaded motor coach was Engineman Frank Carpenter, also of Tracy. He and Conductor Innes alternated going to the engine for coal. Carpenter was preparing for his turn and Innes went to the passenger compartment of the motor car, located at the rear, apparently having no knowledge that there was no longer anyone at all acting as flagman. Meanwhile, at the Huron Depot, the crew of passenger Train #412 was preparing for its run. Dispatcher Kelley came on duty at 6:30 a.m., and discussed the situation with the night shift dispatcher, who informed him that all communication east of Huron was down. However, he had no reason to believe that the previous nights’ train, #504, had not been successful in reaching its destination. As Dispatcher Kelley was preparing to issue orders for the outgoing train, he was distracted by a train patron inquiring about shipping animals, and he inadvertently issued the conductor a clearance card reading “block clear” rather than issuing a caution order. 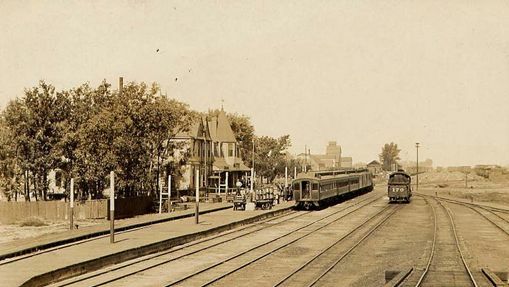 At 8:18 a.m., Conductor Hittle and crew left the depot 13 minutes behind schedule. Engineman J. C. Shephard noted the severity of the storm, but the visibility was at least good enough to see the front of the engine, and the train had no trouble attaining its regular speed. But all that changed as they went through Manchester; the snow on the tracks caused the train to lose speed, and Fireman Hoffman expected a stall, but Engineman Shephard was able to use more steam to get the speed back up and keep the train moving. Their speed was up to about 20 mph, but visibility was so poor that the front of the engine was now a blur in the blizzard conditions. In De Smet, Train #504 Conductor Howard discovered that communication lines were down in the whole area. He knew he would not be able to contact the depot in Huron, but was at least hoping to contact someone in Iroquois to warn of the stall. He stayed in De Smet until 5 a.m., then headed back toward his train, but discovered the drifts had become 2-3’ deep and was forced to return to De Smet. He was surprised shortly after that when his Flagman McIntyre showed up at the De Smet depot. When Howard inquired who was doing the flagging, he was told that Venard was handling it. They were in the train station when the mail clerk came over and told them that the unthinkable had happened. There was nothing the crew of Train #412 could have done to stop the crash. They heard no torpedoes, and saw neither fusees nor a flagman. After the accident, Train #412’s Flagman Shanahan went to the rear of the train to flag, and found an unexploded torpedo about a half mile behind the train – his train had slid right over it.1 He walked the 6 miles back to Manchester, and his face became covered with ice in the nearly 3 hours it took to get there. The deadheading motor car with Conductor Innes and Engineman Carpenter was the first to be hit, and it was hit hard. Made of steel, it was crushed like a piece of aluminum foil, “telescoping” it. Conductor Innes was in the rear part of car, and was critically injured. Engineman Carpenter, in the front part of the car, sustained a broken nose, numerous head lacerations, and bruises. After the motor car was hit, it propelled into the main train, partially derailing it and causing minor injuries among the passengers. Had the motor coach not been detached, the situation would have been much more serious than it already was. A plea was immediately made in the passenger car for anyone with any medical skill to help. A young Huron College student, Paul Besselievre of Pierre, was traveling to Irwin, South Dakota to preach a Sunday sermon, and his scouting experience gave him some basic first aid skills. A nurse, Miss Beulah Vostad of Rapid City, was also aboard. Nurse Vostad attended to the more seriously injured Conductor Innes while Besselievre cleaned and dressed Engineman Carpenter’s wounds, stating that the hardest part was keeping Mr. Carpenter still – he was compelled to go to the main train to see what he could do to be of service, despite his wounds and dazed condition. Unfortunately there was not much that could be done for Conductor Innes other than an injection of morphine to ease his pain. He was talking coherently Sunday night, but took a turn for the worse and passed away the following day. This was the Perfect Storm of conditions – snow, wind, lack of visibility, downed phone lines, and a number of critical human decisions that went wrong. The investigation questioned why the flagman would leave his job, which was paramount to the safety of everyone on the train, to duplicate the efforts of his conductor. His replacement went “off-duty” in an emergency situation. The next replacement apparently did not know he was expected to act as flagman in addition to what he was already doing. In a moment of distraction, the depot clerk did not caution the outgoing crew of a potential problem down the line. These were all factors that came together resulting in a large amount of damage and most importantly, the loss of Conductor William Innes’ life. 1Pg. 63 of Accident Bulletin, Issues 63-82, by United States Federal Railroad Administration, Office of Safety. Years ago, I found digital copies of the 1880 Agricultural Schedule for my direct-line ancestors, William Graves and Lawson Lair in Peoria County, Illinois.1 The headings of the schedules were impossible to read, and I wasn’t terribly sure how valuable any of the information would be, so I stashed them to deal with later. Yesterday I decided to put the effort into seeing exactly what was on those schedules. I was able to find a document online with information on the agricultural schedule and blank forms for several years2; then began the work of going back and forth between the blank form and the schedule until I had extracted the information. I repeated the process on the second schedule I’d downloaded for Lawson Lair – but discovered that William Graves was also listed on that schedule as well! Princeville Township only had one William Graves during that time period, so I assumed he had a second farm somewhere in the township. I was aware that William, through thrift and hard work, had given each of his children (including his daughters) their own 80 acre farm when they became adults. I began looking at plat maps for various years, and looking at neighbors both on the plat maps and on the agriculture schedules to determine which schedule entry pertained to which of the farms he owned. As it turns out, one schedule entry notes that William does not own this particular farm, but is leasing it for a share of the profits produced. Looking at the other entries on the schedule and comparing them to neighbors listed on the plat maps for 1873 and 1896, I was able to determine the farm was located in Section 4 of Princeville Township, land that William owned in 1873 and his daughter Sarah A. Cox owned in 1896. Sarah was married to Charles Cox in 1874, and may have been given that farm at that time, or at least prior to 1880. 1873 Plat map of Princeville Township, Peoria County, Illinois. 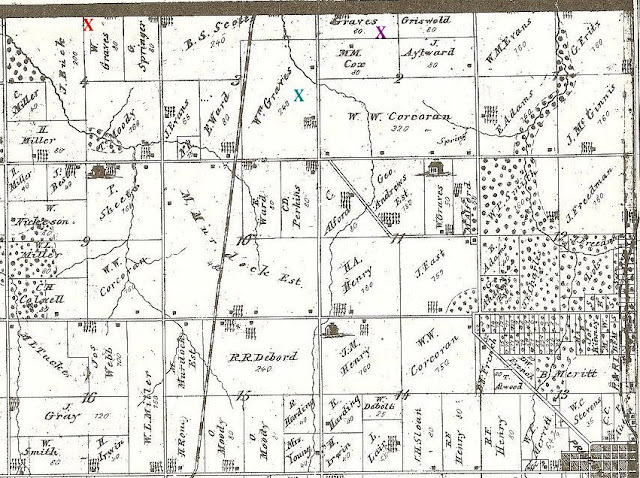 The red "X" in the upper left corner shows the location of land that would later belong to William's daughter Sarah; the green "X" toward the center shows the location of William's farm, with land he'd later give to Tom and Oscar; across the road, denoted by the purple "X" is the land that would later belong to Austin. The second entry is a bit harder to explain. Again, looking at those around him both on the schedule and on the various plat maps, this farm appears to be his personal farm. William had purchased land that was clustered around his primary farm in the western half of section 2 and the eastern half of section 3. 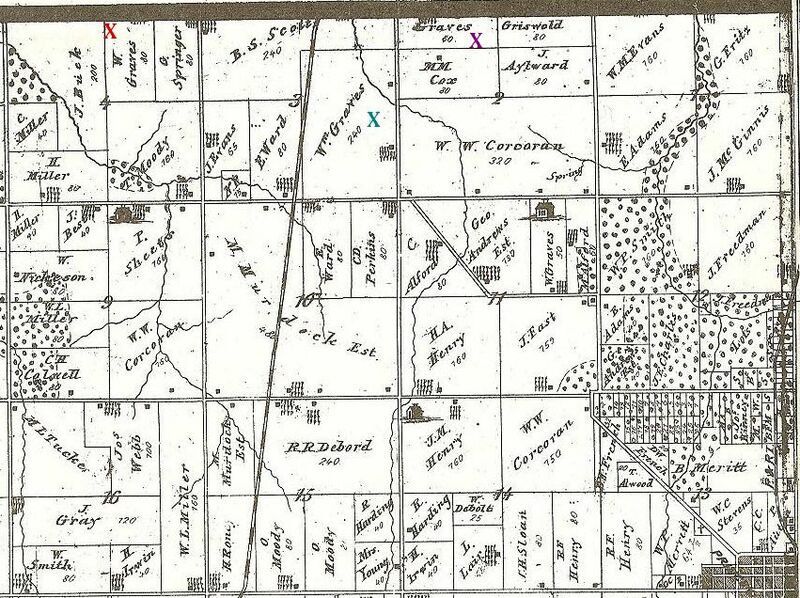 On the earlier 1873 plat map, the section 2 land had been divided into two farms – one owned by his daughter, Martha Cox, and the other in his name. Later that land would go to his son, Austin, who was just 3 at the time this map was created. 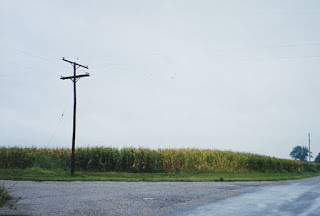 Across the road, in section 3, he owned a 240 acre farm, which would by 1896 have been divided into thirds – 80 acres for his son Oscar, 80 acres for his son Tom, and 80 acres for himself. But this does not explain the findings on the 1880 agriculture schedule – William’s farm was described as 80 acres. Twins Austin and Oscar would have been just 10 at the time of the schedule, and Tom would have been 18. It is conceivable that Tom had gotten his farm by 1880, but unlikely that Austin and Oscar’s would have been in their names. Perhaps these 240 acres of unaccounted-for land was rented out and appears on the schedule under the renter’s name. Thus, William’s second appearance on the schedule with 80 acres of land would make sense. William Graves' land, photo taken about 2007 by author. Regarding the specifics of William’s farming, he tilled 79 of the 80 acres on Sarah’s farm, but only 30 of his own, keeping the remainder as meadow or pasture. Each farm produced about $700 for the year in profits. He kept horses, pigs, and chickens at both places, but also kept cattle on his own farm – 2 cows for milking and 16 others to sell or slaughter. 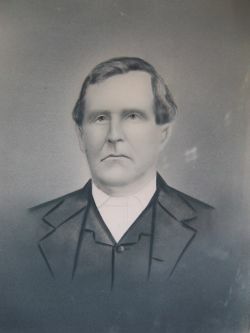 Butter was produced on his home farm – 150 pounds in 1879. Crops grown on both farms include Indian corn, oats, and Irish potatoes (as opposed to sweet potatoes). 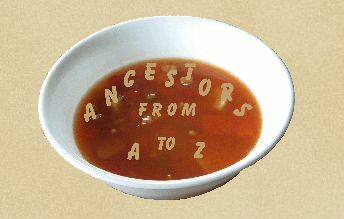 100 bushels of apples were sold from the orchard on Sarah’s land, and 125 gallons of molasses were produced from there as well. Besides an interesting snapshot of what a typical workday for William may have looked like, finding these two entries on the agriculture schedule really forced me to take a good look at William’s land ownership and how his land acquisitions were divided among his children, and when that may have occurred. I have one question I wish I could ask William’s wife: Who really churned all that butter?? 1 Both these men were great-grandfathers of Bill Knutz Jr. William Graves’ son Tom married Lawson Lair’s daughter Nettie, and they were Bill’s grandparents.